From groceries to gas to gadgets, rewards cards help you earn cash, points or miles from your everyday purchases. You can redeem your rewards for cash, shopping or travel. We analyzed 1,640 different rewards cards to give you the best recommendations - check out the 10 best rewards credit cards from our partners below. Rewards credit cards have proliferated in recent years, with the best offers delivering cardholders hundreds, even thousands of dollars in rewards. 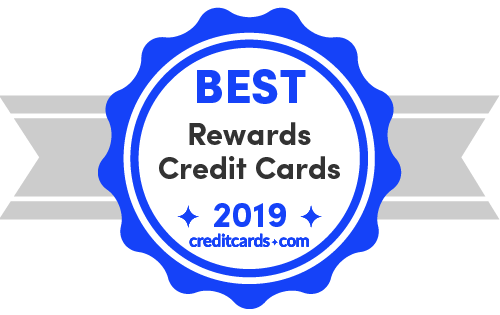 It is not surprising that rewards cards claim several spots on our list of the overall best credit cards 2019. Cashback, points, miles – whichever method you choose, the results can be, well, rewarding. In fact, because it is accepted that merchants up their prices to accommodate their costs due to credit card fees, consumers who use cards for their purchases actually come out ahead by $240 a year, while consumers who don't end up behind to the tune of $50, according to the Federal Reserve of Boston. While many credit cards offer some form of rewards, we've limited our list to the best current offers. The top rewards credit card is the Capital One Savor card due to its large sign-up bonus and high cash back percentages on multiple categories. Pros: With 50,000 miles after a $3,000 spend within the first 3 months, 2X miles on all purchases and 10X miles on hotel stays purchased through hotels.com/venture, this card offers a host of travel rewards and features. Venture Rewards is currently partnered with 14 airlines where you can transfer your miles. The Venture Rewards Credit Card is a fine choice for both domestic and foreign travel because of its versatility. Fly any airline and stay at any hotel—there are no blackout dates. Cons: Although your annual fee is waived the first year, you will eventually have to face the music by paying $95 each subsequent year. Pros: With no annual fee and no limits on rewards, this card's got what it takes to turn your head and race your heart. Earn 3X points for eating out and ordering in; gas stations, rideshares and transit; and travel, including flights, hotels, homestays and car rentals. There's also the 30,000 points after a $3,000 spend within the first 3 months. Cons: You'll have to look hard for something not to like about this card, although there are no boosted rewards for such categories as Amazon.com, wholesale clubs and home improvement stores. Pros: Earn 60,000 points after a $4,000 spend within the first 3 months of card membership and 2X points on worldwide dining and travel. In preparation for your upcoming travel, take a look at this card, with its partnerships with major airlines and hotel brands and a 25% redemption boost when booking through Chase Ultimate Rewards. Cons: There's so much to love about this card that it's hard to find a downside. However, one potential setback is the $95 annual fee. Pros: While other cards offer tiered rewards for specific spending, this card is one of the few that rewards with 5% cash back on rotating categories, plus another 5% back at the end of your first year. Categories can include restaurants, gas, groceries and more. For example, for March through May 2019, it's gas stations, Uber, and Lyft. While there is no traditional sign-up bonus, Discover will automatically all the cash back you've earned at the end of your first year. Cons: This card can be a bit of a hassle, because you have to enroll each quarter to qualify for the 5% rewards. Note that the 5% rewards rate will only apply up to the $1,500 quarterly maximum in purchases. Pros: This card has unlimited tiered spending of 4% cash back on dining and entertainment and 2% back at grocery stores. The sign-up bonus of $500 after a $3,000 spend within the first 3 months of card membership is pretty great, even with the annual fee of $95, which is waived the first year. Cons: With no 0% intro APR on purchases or balance transfers, in this aspect the Savor Cash Rewards may not compete well with other cash back cards. Pros: Like several other credit cards with no annual fee, the Cash Wise gets you 1.5% cash back on all purchases. However, it also has the unique rewards feature of 1.8% cash back on qualified mobile wallet purchases for your first 12 months. It's also worth noting that the cash back sign-up bonus is above average: $200 after you spend $1,000 within the first 3 months. Cons: Cash redemption is limited to increments of $25 online or by phone and $20 at ATMs. Pros: The SavorOne's best categories are in dining and entertainment, where it earns 3% cash back. It also earns a solid 2% cash back at grocery stores and 1% cash back on everything else. These excellent rewards, plus the card's $150 sign-up bonus for spending $500 in the first 3 months, come with no annual fee. Cons: Some consumers might find the SavorOne's offer less attractive than the Savor card's, although the latter charges an annual fee. Pros: This card goes above and beyond competitors like the Quicksilver, due to its superior 3% cash back on all purchases in the first year, on up to $20,000 spent. After that, the cash back rate is an unlimited 1.5% on all purchases. While there is no traditional sign-up bonus, the elevated cash back in the first year makes up for it. Features include concierge service, as well as an extended warranty program and purchase protection – not bad considering there's no annual fee. Cons: Unlike the Capital One Quicksilver, the Chase Freedom Unlimited has a foreign transaction fee of 3%. Pros: There's no annual fee or foreign transaction fee, and the sign-up bonus is a competitive $150 after a $500 spend within the first 3 months of card membership. Features include free credit score monitoring, purchase security, baggage insurance, VIP access to events and more. Cons: You can do better than the 1.5% cash back on all purchases, although you may have to shell out for an annual fee with another card. Pros: The $200 welcome bonus (after a $1,000 spend within the first 3 months) is one of the best among cash back cards, and no one beats the 6% back at U.S. supermarkets (up to $6,000 a year, then 1%). You can also earn 3% back at U.S. gas stations and select U.S. department stores. Cons: The $95 annual fee isn't waived the first year, although the statement credit you can receive as a welcome bonus can more than make up for that the first year of card membership. We analyzed over 1,600 rewards credit cards and looked at 9 main factors to identify the best cards for your lifestyle – these factors and more inform our decisions in which cards can work the hardest for you. Rewards rates – When studying cards, you might see rewards as points, miles or cash back. We look at not only the type of rewards, but also how they are doled out, whether as cash back on select categories, such as Discover it Cash Back or multiplied points on every purchase, as in the case of Capital One Venture Rewards. Sign-up bonuses – These can also come as points, miles and cash back. We study how much the bonus is, as well as the required spend and the time limit. For example, the Chase Sapphire Preferred offers a sign-up bonus of 60,000 points when you spend $4,000 within 3 months. Customer service – Some card issuers stand out for their customer service, such as Discover's U.S.-based customer service 24/7. We look at that as well. Redemption options and flexibility – Card issuers vary in how you can redeem rewards. For example, Bank of America allows you to receive cash back by check. Issuers typically allow you to receive a statement credit, redeem for gift cards or merchandise, and in the case of the Chase Sapphire cards, earn bonuses when you redeem for travel through Chase Ultimate Rewards. We also study minimum required redemptions and expirations. Point values – Point valuations on rewards cards can vary widely, from under 1 cent to over 2 cents per point or mile. Also, you can get a bonus when redeeming for travel in some cases, such as the Ink Business Preferred. Travel benefits – Many travel and other rewards cards offer travel and purchase benefits in addition to points, miles or cash back. These are helpful when you are on a trip and you need extra support, such as lost luggage reimbursement and travel accident insurance with the Bank of America Travel Rewards credit card. Transfer partners – Even if you hold a loyalty card, such as an airline or hotel card, there may be partners that you can transfer your points or miles to. We look at which and how many partners cards have and the value of the transfers, because some partners have a lower valuation than if you use the points with the original hotel or airline. Rates & fees – These range from the annual fee, if there is one, to the regular APR, which can go from less than 10% to more than 25%, depending on the card and issuer. Some issuers offer no late fee, which we study when we ascertain a rewards card's value. Credit needed – No matter how much you love a card, the issuer will want to make sure you are a good risk and check your credit before you are granted the product. We note whether each rewards card requires credit from bad to excellent or no credit. What are rewards cards and how do they work? Points, sometimes called miles, on a credit card are designed to reward you for using the card or for loyalty to a brand. You can earn points through different types of spending, including general spending, restaurants and world travel, or shopping with a hotel or airline brand. Many rewards cards, particularly travel rewards cards, offer generous sign-up bonuses. Used correctly, cards' sign-up bonuses can reward in the thousands of dollars. For example, at one point in 2016, Chase Sapphire Reserve rewarded up to $1,500 worth of points through a 100,000-point sign-up bonus and use of the Chase Ultimate Rewards travel portal. Often, you can get boosted points for specific types of spending, 3X points and more. Points can be valued at below $0.01 and above $0.02 upon redemption, depending on the card. They can be redeemed for travel, shopping and more. You probably have a points chaser in your life, whether it's your office mate or roommate. This person loves to build rewards to be redeemed on trips across the country or around the world. Now, you're wondering: "How do I get in on this?" You're not alone. Actually, in a recent study, we found that rewards are the favorite use for consumers' most-used card. So, we've established that rewards cards are pretty awesome. What do you need to know before you get started? For example, you might be eyeing a cash back card that offers improved rewards on everyday spending, such as the Blue Cash Everyday or Blue Cash Preferred. Or you might want to look at a good general-purpose travel card, such as the Capital One Venture Rewards or VentureOne Rewards card. When you are shopping for a rewards card, you see that they vary widely in whether they have an annual fee, a sign-up bonus and what kinds of ongoing rewards they have. So, while most cash back cards have no annual fee, many travel cards do. And while you will be hard pressed to find a cash back card with extensive travel benefits, travel cards will likely have them in abundance. When earning rewards, whether it's cash back or points or miles, you'll want to make sure the card you choose reflects how you shop. For instance, if you do a fair amount of shuttling the family in the family van, the Bank of America Cash Rewards card could be right for you if you choose gas as your 3% cash back category. When it comes time to redeem, you might choose a statement credit, a gift card or merchandise, or travel. Just know that certain cards favor certain types of redemptions – for example, in some cases, it may be more to your advantage to redeem for travel than to use the rewards for a gift card. Bottom line? Take your time, shop around and use our excellent tools to pick the right card for you. Remember, if you don't choose a card that plays to your spending strengths, you are just leaving money on the table. We got a bit of a surprise when our October 2018 poll by YouGov PLC showed that about a quarter of those polled did not hold a credit card. With all the great rewards cards out there, that's money left on the table. Rewards cards can deliver great benefits, waived fees, and of course, points, miles or cash back. However, if you have trouble meeting your budget, or you tend to overspend, then they may not be so great for you. Some disadvantages may actually be a blessing in disguise, such as annual fees, because they can be indicative of a card that offers superior rewards. But that's not always true. That's why you should thoroughly research your choices before applying. Here, we look at the pros and cons of rewards credit cards to help you decide if they are right for you. Accrue points, miles or cash – Earn hundreds of dollars a year in points, miles or cash back. It doesn't get better than this. Travel and shopping perks – Rewards cards can offer extended warranties, rental car insurance and other travel and shopping benefits. Build credit – As with most credit cards, this is a great way to build your credit, provided you pay on time each month. Higher credit score required – While there are credit-builder cards that have rewards, the cards with richer offers tend to require higher credit scores. Make sure you check the required score of a card before applying. They can cost you time – Many rewards cards can require you to spend some time maximizing points or cash. For example, if it's a card with rotating categories, you need to sign up for categories, then make sure you maximize spend without going over budget. And some travel cards have blackout dates and limit your choice in travel partners. However, there are rewards cards with flat rates if you don't want to invest time on your rewards. Damage credit/budget – While you can improve your score with each month of on-time payments, you can destroy it with high balances. Also, you can blow your budget it you don't pay attention to your spending, as well as undo any earnings you've made through rewards. Also called fuel cards, this product dates back to the 1920s when the primary purpose was convenience. With the advent of rewards cards that also reward you for groceries, wholesale clubs and restaurants, rewards cards have all but replaced the gas credit card. That said, gas cards can reward you generously for each gallon and sometimes only require fair credit. If you're on the road a lot, this might be a good choice. There are basically 3 types of travel cards: general purpose, airline and hotel. Some travel cards reward you for most brands through a redemption portal that tracks your travel expenses. This is a good choice if you don't travel with a particular brand. Or you can choose an airline or hotel card, which partner with specific brands. Because hotel partnerships are so large today, you can access hundreds of hotels in dozens of countries with a single card. Originating in 1986, Discover developed its products as a way to give money back at the end of the year based on the amount of charges. The cashback product has expanded to cards that give cash back in statement credits, checks and deposits in bank accounts. Cash back can be 1%-2% back for everything or for quarterly categories, which typically have a greater reward. If you want rewards without thinking about it, a general-purpose cashback card might be the right decision. Sometimes called co-branded cards, this product is a type of loyalty card that is tied to department stores or other store brands. These cards can offer high percentages of cash back for first purchases and more. If you travel often and don't particularly love it, luxury cards can be a good choice because you can get 24/7 concierge service, access to airport lounges and more. Many card issuers offer varying types of rewards cards, frequently with greater rewards than consumer rewards cards. You can get cash back or points for business-related spending. If you often spend on business items, a business card might be an option. Sometimes cards for fair credit and even secured cards offer rewards, typically 1% back on purchases. Credit card rewards programs come in any number of flavors, and one of them is bound to work well for you. There's Chase Ultimate Rewards, with generous rewards for your loyalty. And what about American Express Membership Rewards? Then, there are popular hotel rewards plans. Here are some popular rewards programs and how they work. Cards with annual fees – Chase Sapphire Preferred and Reserve and Ink Business Preferred boost your Ultimate Rewards redemption value by 25% or 50%, depending on the card, when you use the points toward travel in the portal. Cards without annual fees – You can use the Chase Freedom and the Ink Business Cash to collect points to be used on the Ultimate Reward portal. One benefit: You can transfer the points on these cards to the cards with annual fees and enjoy the boosted bonus of the superior card. Earn points through worldwide travel and dining, business categories, rotating categories such as gas and groceries, and more. With the Ultimate Rewards portal, you can book all types of travel with partner brands, including air travel and cruises, or enjoy redemptions for such items as gift cards and merchandise. Myriad Amex cards use the Membership Rewards program, including the American Express® Gold Card and the Blue Business Plus. You can earn Membership Rewards through eligible airfare, hotel stays, car rentals, retail purchases and more. There are also opportunities with eligible business purchases in the U.S., such as office supplies, wireless service, shipping, advertising and computer hardware/software/cloud computing. Membership Rewards points can be used toward a shopping portal for such brands as Amazon.com and Staples. You can also use your points to cover card charges or for gift cards. One of the most popular uses is as a travel portal. You can enjoy more value when you transfer the Membership Rewards points to miles and redeem them for international flights in business or first class. You can also experience bonus points for transfers with American Express' airline partners. With the Hilton portfolio, which includes such brands as Waldorf Astoria, Homewood Suites and Curio, you have access to 5,000 hotels and resorts around the world. Add to that, you can experience the benefits of the Hilton Honors program, which gives you access to these properties through the points you have collected with purchases. In addition to earning points at member properties, earn points through partners for car rentals, cruises, even mobile roaming while abroad. You can use the points as a gift by purchasing gift cards at Hilton locations or treat yourself with a weekend at a favorite spot. Also enjoy using the points toward flights and rail travel, vehicle upgrades and more. With the Marriott Bonvoy rewards program, you have access to 6,700 participating hotels across 29 brands after combining your rewards accounts. Member properties include Westin, Renaissance Hotels, Springhill Suites and more. The Marriott Bonvoy program lets you earn points through introductory bonuses and ongoing purchases with credit cards that partner with the program. Points can be used toward stays at these properties or through partners, allowing you to use them toward air travel, ground transportation, and gift certificates to such brands as Starbucks and iTunes. They can also be donated to charity. When you are trying to choose the right rewards card for your lifestyle, it can be overwhelming. But with a little homework, you will find the perfect card. It's really just a matter of asking yourself a few questions, such as what you plan to use it for and what benefits does the card offer, then deciding if that card will work into your shopping and budgeting routine. Do you have the right card? Before doing anything else, make sure you have the right card for your habits. If you travel often with a favorite airline, a branded card might be a good option. If you are an occasional traveler, a general-purpose card might be best. What are the benefits? Rewards cards often have benefits beyond points that make using your card worthwhile, including access to airport lounges and rental car insurance. Will you shop? Often, cards will have shopping portals in which you can use your points or miles. Are you overreaching? Don't put anything on your card that you don't already have the money for. Remember, credit cards aren't designed to be long-term loans. Are you paying in full? Each and every month, pay in full to avoid those interest charges you pay when you carry over a balance to the next month, charges that basically undo the rewards you've received. Are you paying on time? Paying late can mean not only late charges, it can put your account and credit in jeopardy. Calculate. Calculate how much you'll spend, making sure you will at least recoup the annual fee. Take advantage of the sign-up bonus. Make sure that you will be able to spend the required amount within the required time for the sign-up bonus, but avoid the temptation of making extra purchases just for the sake of reaching the required spend. Stick to sign-up bonuses that you know are attainable from your regular or pre-planned purchases. Make it your go-to card. See if you can pay your rent, insurance and utilities with it, but make sure there are no convenience fees. Buy your groceries with it, and pull it out at restaurants. Pay in full and pay on time. If you can't pay it off in full each month, there's no point in acquiring it. The interest fees will overshadow any cash back or points you've earned. Never go over the limit or pay late; these are wasted dollars. Use shopping portals. Frequently check for deals. Just make sure you are fully rewarded for using points or miles. Some cards don't reward you for the full amount with their shopping portals or gift cards. Take full advantage of the benefits. Make full use of the benefits, such as price protection and auto rental insurance. A portal for travel purchases. With some cards such as the Chase Sapphire Preferred and Reserve, a travel portal can be used to make purchases using points, with additional rewards for using the portal. A portal for redemption. With general-purpose travel cards, you can redeem your miles for all manner of travel through a portal that monitors your rewards and travel spending. Redeeming for specific brands. With hotel- and airline-branded cards, you can redeem for those specific brands and sometimes their partners. Online shopping. Redeem your points through a shopping portal for such items as clothing, health and beauty aids, gift cards, and more. Get a check. A few card issuers will issue a check for your cash rewards. Deposit into bank account. This is a great option for Bank of America Preferred Rewards clients. Statement credit. A favorite among cashback cards, you can earn your redemption through a credit that is placed on your card statement.